As I sit here and type with the window open next to me, I am reminded that spring is just around the corner and I can't wait to go out and start working in my garden. I can hear the water that has melted from the snow as it drips of the back deck, I hear the sweet call of the birds in my back yard, and my kids are all excited to see the (muddy) ground again. With these thoughts in mind, I thought it would be fun to do a spring themed card for the ScrapbookPal blog with the new Nate's ABC's cartridge that I received from ScrapbookPal this month. -Cut your card base at 11 x 5 1/2 inches and fold in half to make a 5 1/2 x 5 1/2 inch card. -Cut the circles from the Nate's ABC's cartridge at 4 1/2 inches for the color background and 4 1/4 inches for the white base and layer these two together. Draw stitches around the white circle with a Tombow dual brush pen. -Cut the umbrella and boot image from the Nate's ABC's cartridge along with all the layers at 2 3/4 inches. Add a little ink from the Tombow dual brush pen to add depth if you wish. Layer the pieces together and adhere to the center of the circle base with dimensional adhesive. -Cut and adhere 5 x 5 inch piece of patterend paper to the center of the 5 1/2 x 5 1/2 inch card base. -Tie a ribbon around the patterned paper and card base and finish it off with a bow. -Adhere the circle with the image over the center of the patterened paper with dimensional adhesive. -Add a button to the center of the bow and a sentiment. 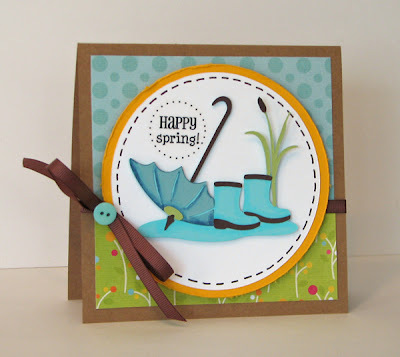 Thanks for stopping by and I hope I have inspred you to get started on some spring themed projects of your own. This card is so adorable. The colors and the design make me smile! So cute. I love the papers! Lovely card! Beautiful background papers. Great card!! Love all of the bright happy colors!